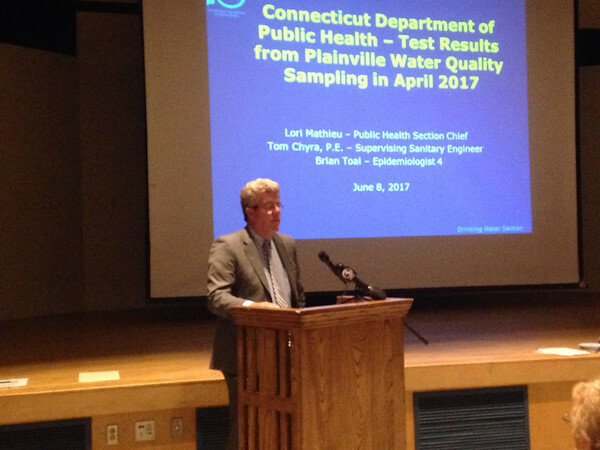 PLAINVILLE - The town has scheduled a public information session for May 14 at the Middle School of Plainville to discuss the results of a recent hard-water study by Valley Water Systems, Inc. The study determined that it would cost $3.66 million to install equipment to fix the problem and $99,000 annually to operate that equipment. The session will be held at 7 p.m. at the school at 150 Northwest Drive. Officials from PURA (Public Utilities Regulatory Agency) and the Department of Health will be present along with officials from Valley Water Systems, which provides the town’s water. The town’s water comes from underground, rather than a reservoir. Valley Water began an evaluation with Tighe & Bond of how to “soften” the town’s water supply after more than 100 residents complained in 2017 to Town Manager Robert E. Lee that their water had an unusual taste or odor. Hard water can lead to scale formation inside pipes and may cause laundry machines and dishwashers to wear out more quickly. The taste and odor came from the presence of naturally occurring calcium and magnesium, which are consumed regularly as part of the human diet. This calcium may create a white residue on shower walls, dishes and glassware, but there is no negative health impact. Valley Water Systems posted a summary of Tighe & Bond’s findings on their website, valleywatersystems.com. This will be discussed in-depth at the meeting. According to an executive summary posted on Valley Water Systems’ website, the water hardness of Plainville is above 150 milligrams per liter throughout the distribution system. There are parts as hard as 194 and 223 milligrams per liter. The goal of the study was to determine how to get the hardness less than or equal to 150 milligrams per liter. The study also evaluated reducing the use of the wells and purchasing water from New Britain to supplement the supply. Posted in The Bristol Press, Plainville on Monday, 15 April 2019 21:18. Updated: Monday, 15 April 2019 21:21.